Julie Bassitt, Pet Partners volunteer, and her 2-year-old therapy dog Sophie visit with Stacy Smith, a patient at Lima Memorial. 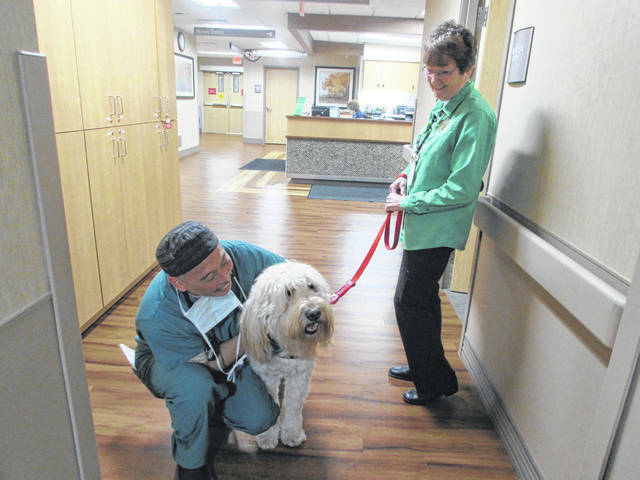 Scott Watamura, Lima Memorial Hospital anesthesiologist, pets therapy dog Max, 7, owned by Helen Bibler, right. From left are Pet Partners volunteers and their therapy dogs Helen Bibler and Max, Stephanie Spees and Snickers, Lynette Main and Shea, Paula Reese and Sadie and Julie Bassitt and Sophie. LIMA — Staying in the hospital can be a scary situation for patients, but having a visit from a therapy dog provides comfort in a trying time. Pet Partners, an animal therapy program that is a national organization, first came to Lima Memorial Health System in 2004. Helen Bibler, therapy dog program coordinator, and her dog Max, 7, have been in the program together for six years. She previously had a dog named Bear who was a part of the program, but it died last summer after being a therapy dog for 10 years. There are currently 11 dogs and 10 handlers in the program at Lima Memorial. The handlers are required to take an online exam, and the handler and dogs complete an evaluation. “The dogs are required to know commands and know not to jump, bark or growl and lay down, sit, stay and leave it,” Bibler said. The handlers train the therapy dogs or can receive training locally. The handlers and their dogs are allowed to visit the hospital for two hours a day whether they visit the hospital, schools or colleges. Bibler said Max has helped patients who were anxious about their surgeries. “We have had patients who have not talked to anyone in a while, and they will pet the dog, and the next day talk to someone about it,” Bibler said. She said the dogs not only put smiles on patients faces, but also doctors, nurses and surgeons at the hospital. In addition to cheering up patients at the hospital, Max serves as a reading dog at Heritage, Independence, Elida, Allen East and Heir Force schools and Lima Public Library. Volunteers with Pet Partners who take their therapy dogs to Lima Memorial discussed how their dogs helped others in a time of uncertainty. Paula Reese and her 9-year-old therapy dog visit Lima Memorial on Thursdays. Reese got Sadie when she was 9 weeks old, and she has been a therapy dog since she was 2 years old. 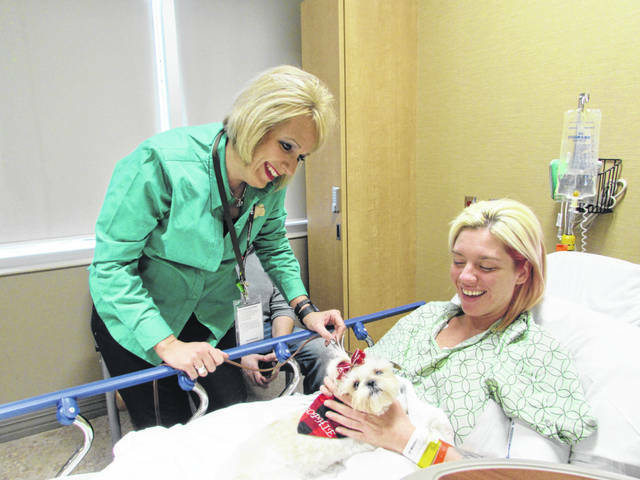 “She comforts the patients, doctors and staff if they are having a stressful day,” Reese said. A lot of times patients who stay at the hospital have pets at home they miss, so it is exciting to interact with the therapy dogs, Reese said. Reese and her dog also visit Cridersville Elementary to visit with special needs children, and they visit Wapakoneta Middle School, Wapakoneta and Cridersville Public Libraries and the Hancock County Jail. Lynette Main has two therapy dogs, Shea and Zane, who visit the hospital to cheer patients up. “You walk into the room and down the hall, and they light up when they see the dogs,” Main said. Julie Bassitt and her 2-year-old dog, Sophie, visit Lima Memorial a couple times of month. Sophie has been in therapy dog training since she was 8 weeks old. “Sophie is small; she is only 7 pounds. We lay a blanket on top of the patient, and they can let the patient pet her and they love that,” Bassitt said. She said a lot of people can relate to dogs. They may have dogs at home, so it helps patients get their mind off their pain. “Our goal is to make everyone smile and know that everything is going to be OK,” Bassitt said. https://www.limaohio.com/wp-content/uploads/sites/54/2018/12/web1_IMG_1927.jpgJulie Bassitt, Pet Partners volunteer, and her 2-year-old therapy dog Sophie visit with Stacy Smith, a patient at Lima Memorial. https://www.limaohio.com/wp-content/uploads/sites/54/2018/12/web1_IMG_1922.jpgScott Watamura, Lima Memorial Hospital anesthesiologist, pets therapy dog Max, 7, owned by Helen Bibler, right. https://www.limaohio.com/wp-content/uploads/sites/54/2018/12/web1_IMG_1912.jpgFrom left are Pet Partners volunteers and their therapy dogs Helen Bibler and Max, Stephanie Spees and Snickers, Lynette Main and Shea, Paula Reese and Sadie and Julie Bassitt and Sophie.